Hitchcock began as a title designer and an art director before graduating to the director’s chair and he draws on those talents, as well as his lessons from the German film studios where expressionism was the rage, for this film. The Avengers signs his work with his name penciled in a triangle on notes left on the body. That triangle is echoed through the graphically stark intertitles (created by Ivor Montagu), notably branding Daisy’s name in her introduction. The film is subtitled “A Story of the London Fog” and indeed mist plays a major cinematic role in the film, providing both atmosphere and a dramatic sense of isolation and cover. The London created in the studios is a lost world of pools of lamplight on cobblestone streets, the streets eerily lonely. As Daisy and Joe kiss after the arrival of the Lodger, the camera looks up to the ceiling and the swinging chandelier and Hitchcock makes the floor disappear, dissolving to a shot of the Lodger pacing over a glass floor. It’s not just a cinematic way to suggest what they hear, it’s the first hint of the Lodger coming between the couple and, as the film returns to the swinging chandelier, becomes a metaphor for his restlessness, the family’s suspicion of him, and the mystery of his odd behavior hanging over the film. The introduction of the Lodger is a beautifully orchestrated sequence. The gas lamp of the Bunting kitchen dims and goes out just as he strides into the film, a dark stranger emerging from the fog and coming to their door. 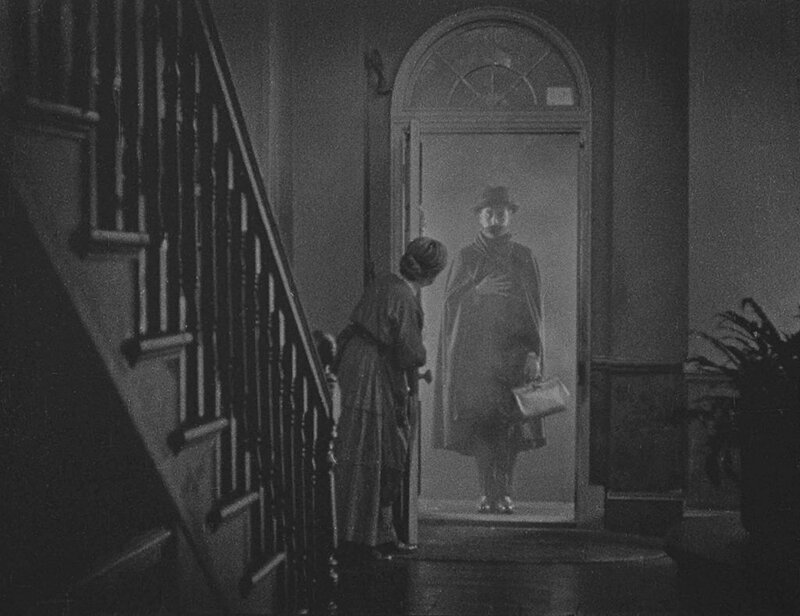 Hitchcock gives him a marvelous entrance: the door opens on a faceless stranger in heavy coat and scarf covering his mouth, stiff and motionless and backlit in the doorway, a veritable golem of the London streets. When the gaslight returns, his startled illumination is like a monster suddenly plucked out of the darkness. As played by Novello and directed by Hitchcock, the Lodger is not just enigmatic and dour, he is stiff, slow-moving, wary, holding himself apart from others, in stark contrast to the exaggerated naturalness of the Bunting family, who are expressive and fluid and emotionally open in their expressions and body language. The Lodger is an alien, almost inhuman presence in their house, like he’s haunting it. The contrast is even more pointed when Daisy and the Lodger are alone together: he dark, stiff, brooding, hidden under heavy clothes, she blonde, lighthearted, quick to smile and laugh. He reacts slowly and intently, like he’s holding emotions in until he can no longer keep them back. She is quick to react to intrusions or accusations. This is Hitchcock’s first film to explore themes of suspicion and guilt. It is also * spoiler alert! * in a change from the novel (where the lodger is indeed the killer), his first “wrong man” thriller where an innocent is hounded for a crime he did not commit. Historians say that shooting was already underway when Hitchcock was forced to change the end of the film—Ivor Novello was a beloved entertainer and decided that he couldn’t be the murderer. The film is so skillfully developed, the suspense so deliberately constructed, and the theme so beautifully visualized in the stunning climax that it seems hard to believe. But in that first act you could see the set-up ready to go either way. If it is true that he rewrote the ending (and added key scenes to set up the storyline) in the middle of shooting, it shows a remarkable resourcefulness. Those flashbacks have a somewhat hackneyed quality next to the ominous atmosphere of the rest of the film but they serve the climax, a harrowing portrait of wrongly-accused man attacked by an out-of-control mob turning suspicion into righteous anger and rumor into justification for vigilante justice. As the Lodger is taken down from the iron fence and carried away with a tenderness in powerful contrast to the violence raging just moments ago, Hitchcock evokes the Pieta: the innocent man sacrificed for the sins of mankind. Criterion presents the American disc debut of the BFI’s 2012 restoration of the film on Blu-ray and DVD. The clarity of the image is unlike any version I’d seen before, a beautiful presentation rich with detail and vivid contrasts with minimal artifacts on the image. It’s black and white with tinting and it is accompanied by a dramatic orchestral score composed by Neil Brand and performed by the Orchestra of Saint Paul’s. The special edition also features the BFI restoration of Hitchcock’s 1927 silent drama Downhill, the film he made directly after The Lodger. It’s a melodrama based on a play co-written by Ivor Novello (“a rather poor play,” as Hitchcock himself confessed) and minor Hitchcock. Downhill stars Novello as a college rugby champion who is expelled from school after taking the blame for his best friend’s indiscretions and continues his spiral downward through the course of the film. What makes the film interesting are the touches Hitchcock brings to the project, the signs of a major talent finding cinematic opportunities in uninspired material. And it is a reminder that before Hitchcock became famed as the Master of Suspense, he directed films in all genres Features a piano score by Neil Brand. Newly produced for this edition are an illustrated video lecture by film scholar William Rothman discussing the visual signatures of Hitchcock used for the first time in this film (31 minutes), the video essay “The Bunting House” by art historian Steven Jacobs exploring the way Hitchcock uses the space and architecture of the film’s central setting (17 mins), and the video interview “Neil Brand: Scoring Hitchcock’s The Lodger” (22 mins). 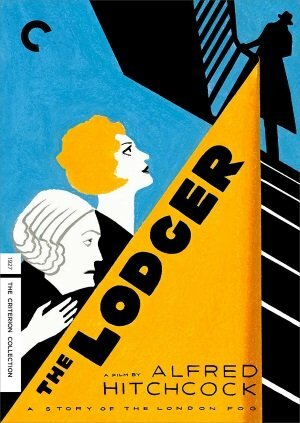 There are also excerpts of archival audio interviews with Hitchcock by filmmakers François Truffaut (1962) and Peter Bogdanovich (1963) and a 1940 radio adaptation of The Lodger directed by Hitchcock, plus a fold-out insert with essays on The Lodger and Downhill by critic Philip Kemp.